A panel of legislators, educators and children's advocates met at the Safe Schools Summit April 16 in a step toward developing recommendations to systematically encourage safe and supportive school environments. The event was sponsored by State Superintendent of Public Instruction Susan Tave Zelman and the office of Ohio Attorney General Marc Dann. Frances Strickland, First Lady of Ohio served as honorary chair. At the summit, the panel heard testimony from educators, medical experts, school safety professionals and law enforcement officials, who presented strategies for improving school learning environments. 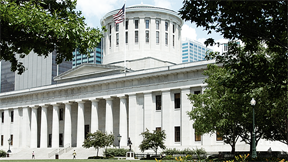 Many speakers addressed suggested improvements outlined in a report titled The Policy Analysis on Safe Schools, which was prepared by The Ohio State University along with an annotated bibliography. The report compares Ohio's school safety policies with other state policies and against national criteria of physical and psychological safety.